UnitedHealth Group kicked off the first-quarter earnings season Tuesday, reporting higher revenue and net income, driven by greater enrollment in Medicare Advantage and higher revenue from its growing Optum business. The Minnetonka, Minn.-based health insurer reported revenue of $55.2 billion in the three months ended March 31, up 13.3% over the same period a year ago. 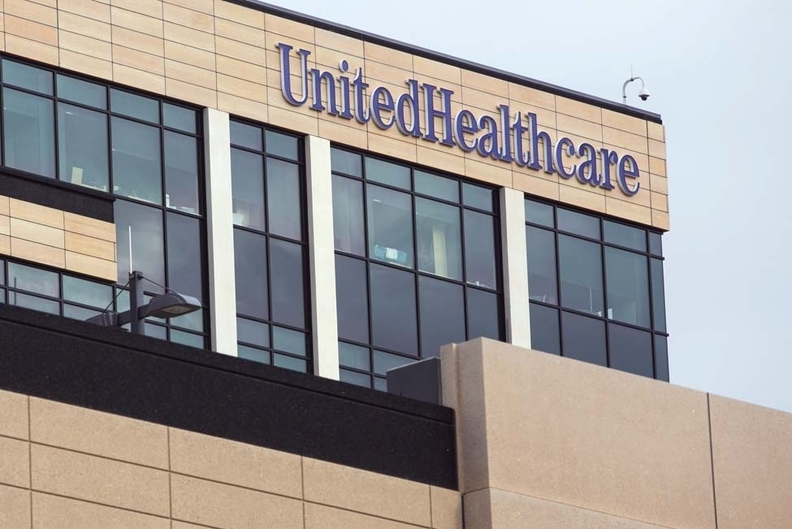 As health insurance companies continue to evolve from their traditional role as claims processors to care facilitators and blur the lines between payer and provider, UnitedHealth leads the pack. Other insurers are playing catch-up. The insurer has been adding doctor practices and lower-cost outpatient facilities to its portfolio of businesses in a bid to better control where patients access care. Most recently, its Optum subsidiary in December said it would buy DaVita's medical group, which boasts 300 medical clinics, along with 35 urgent-care centers and six outpatient surgery centers. The insurer also picked up Surgical Care Affiliates, an operator of ambulatory surgery centers, and MedExpress, an operator of urgent-care clinics, in recent years. The company's OptumHealth unit has more than 30,000 employed and contracted physicians and will add thousands more from the DaVita Medical Group purchase. Optum also launched a $600 million venture capital arm late last year to invest healthcare technology and analytics companies. It tapped current Optum CEO Larry Renfro to lead Optum Ventures, and hired former GlaxoSmithKline CEO Andrew Witty to lead Optum starting in July. "We look very different today than five years ago. For example, clinical and technology professionals are the first- and third-largest job categories across UnitedHealth Group, and we will look different again five years from now as we continue to evolve at an accelerated pace," UnitedHealth CEO David Wichmann said during a conference call Tuesday. Given all its investments, it's no surprise that Optum is UnitedHealth's fastest-growing segment. Its revenue rose 11.1% year over year to $23.6 billion, with earnings up 29% to nearly $1.7 billion. UnitedHealth's insurance arm, UnitedHealthcare, grew revenue by 13.3% to $45.5 billion in the first quarter, while its earnings from operations reached $2.4 billion in the quarter, up 12% over the same time a year ago. Revenue growth was driven by higher premiums and enrollment, particularly in Medicare Advantage. The company's Advantage membership grew 10.6% to 4.8 million over the same quarter a year ago, while employer and individual membership both slipped. Membership in Medicare supplement products totaled 4.5 million, an increase of 3.2% year over year. Revenue from the insurer's Medicare segment totaled $18.9 billion, up 14.3% over the prior year period. UnitedHealthcare's Medicaid membership increased by 8% to 6.7 million. In all, premiums across all lines of UnitedHealthcare's business totaled $44.1 billion, up 13.2%. Enrollment increased by 2.4 million members, or 5.2%, to 48.9 million as of March 31. UnitedHealth recorded a medical loss ratio 81.4%, down from 82.4% at the same time in 2017. The insurer is also benefiting from the Trump administration's tax overhaul, which lowered the corporate tax rate from 35% to 21%. In January, the company said it would reap an extra $1.7 billion in earnings in 2018 thanks to tax reform. For the three months ended March 31, its net income totaled $2.9 billion, up 33.5% from $2.2 billion in 2017.